Joshua Lott/Getty ImagesShoppers walk past a retail shop at Somerset Collection shopping mall in Troy, Michigan. 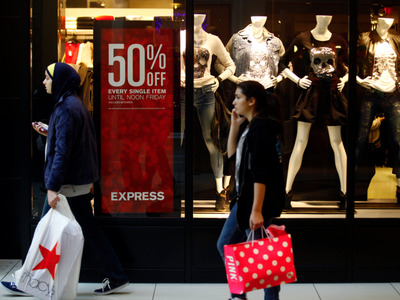 US retail sales rose 0.5% in May according to the Census Bureau, topping expectations. Sales rose at most of the kinds of businesses the bureau tracks, with gas stations and online retailers among the biggest gainers. Gas station sales led the overall advance, as prices rebounded nationwide with crude oil. And, sales at online retailers continued to outpace their brick-and-mortar peers. Bloomberg’s Matthew Boesler noted that for the first time, non-store retailers made up more than 10% of total retail sales in April and May. Additionally, their share of retail sales jumped 0.87% in the year through May, the fastest pace since the peak of the tech boom in the early 2000s. Building-material sales fell 1.8%, the biggest drop among categories. Excluding autos, sales rose 0.4%, and 0.3% excluding both autos and gas, matching forecasts. The retail sales control group, which feeds into GDP, rose 0.4% (0.3% expected). Economists had forecast that advance retail sales rose 0.3% month-on-month, according to Bloomberg. In April, sales rose 1.3%, the largest relative to expectations in more than three years. This reading on consumer spending is an important indicator of how healthy the economy is. “Anemic economic growth over the past two quarters raised fears of a near-term economic slowdown — or worse,” wrote Nationwide chief economist David Berson in a note ahead of the release. “Data in hand for the second quarter suggest that these fears were exaggerated,” he said, with real GDP expected to rebound in the second quarter.